Let me start out by saying that I went for it on Sunday. 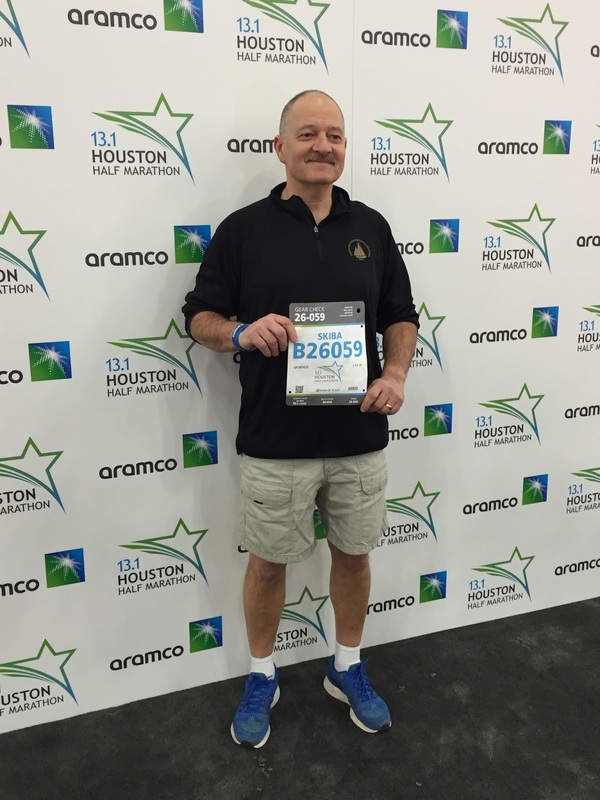 The Houston Marathon end result may have not been what I was hoping for but I FINISHED. I completed my second marathon. Overall the weekend was great! My parents and I arrived in Houston on Friday afternoon, checked into the Hilton Americas Houston Hotel and went right over to the expo to pick up my number. Walking around, I could start to feel that tightness deep in my glutes (from high hamstring) that I had been feeling the past week. The pain that lingered after my 20-miler was gone but during my last few taper runs I could still feel something wasn’t right. That “something wasn’t right” feeling terrified me and I kept wondering how long my hamstring would hold up through 26.2 miles. We met up with family later that night. Uncle Daryl, Aunt Debbie and my cousin Dylan (12 years old) live in Houston. Uncle John, BFF Barbie, and Michele had traveled down from Buffalo. 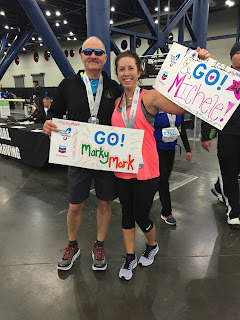 My cousin Michele ran the half with my dad—her first half marathon! On Saturday morning I dragged my dad and Michele out for a short 3-mile shakeout run. I had a proud coach moment when Michele left her headphones in the hotel room because she knew I would say it was a “conversation pace” run! We had a nice run together despite getting verbally abused by a homeless man. I also ran into an old Falmouth Road Race friend who asked me if I was trying to “get the standard.” HA! Saturday night I got comfortable in the recliner at Daryl & Debbie’s house watching football while carb loading up with spaghetti and meatballs. Perfect! After a quick stop at the local grocery for lucky bananas and Greek yogurt, we headed back to the hotel for an early bedtime. Race morning everything was lining up perfectly. Of all the nights in the hotel, that was the only night I had a good night’s sleep. Michele showed up at my door two minutes early. We walked through the GRB and dad’s bag check area was the only one without a line. We walked outside towards the start. It was cool but not freezing. A good cool. (Although at this point I realized I left my headband in the room.) When it was time to split to our corrals, I gave each a big hug for good luck and made my way to Corral A. I spotted the 3:30 pace group and got in line for a Port-a-can. Timing couldn’t have been any better and I had 5 minutes to spare to sync up my watch and re-tie my shoes a million times. Standing at the start during the national anthem, I had all good thoughts. I didn’t even feel nervous. I was just taking it all in. The gun went off and a little over two minutes later, I crossed the start line. My goal going into the race was a 3:30. To achieve this time, I had to run under 8:00 pace the whole way. I was prepared and ready for this. The hardest thing in a race is not getting caught up in the excitement of the gun going off and starting too fast! I crossed the start line just ahead of the 3:30 pace group. I actually wanted to be behind them but I got carried to the start with the crowds before they did! The first 2 miles were BEAUTIFUL. I don’t know how the timing worked out so great but the sun started to come out literally as I started going and the first 2 miles we were running into these pretty, pastel pink skies. It was gorgeous. My cheering squad was hoping to be somewhere around miles 3 and 4 but no one really knew where they would end up. I started looking around for them because if I missed them, I probably wouldn’t see them until close to the finish! The city of Houston isn’t really set up for great spectating. We always compare races to Chicago where the Metro allowed my parents to get to 4 different spots along the marathon course with ease. I stopped looking. Kind of bummed that I wouldn’t see them until the end of the race. I was happy with my pace. I wanted to run pretty even splits for the first half and if I had any oomph later in the race to see what I could do. I saw my family! They were awesome! The split for the half marathon route and the marathon route was a little bit before the 8 mile mark. It was so sad! But the excitement from seeing my family lead to a 7:35 split and I knew I had to slow down or I would be in big trouble. I honestly felt great physically and mentally through the first 10 miles. There were a lot less runners after the split from the half marathoners but it was comfortable running and there were always people around me to try to stay with or catch up to. The mental game really started for me around mile 11. We weren’t quite half way. I knew I was feeling good but the doubt started. Can I run this pace until the end? The “ifs” just turned to “when.” When am I going to start to slow down. When will I hit the wall? When will I start to feel my hamstring? The “whens” got to me and I really slowed down. Mile 12 also featured the first hill! We went over a bridge and it was like WHOA! I got nervous that this would trigger my hamstring but so far so good. Hill #2! This one started on a down slope heading under an overpass and then a long, windy, gradual uphill. By windy I mean curvy not breezy. But breezy it was out along the course. It was funny watching the Houston news all weekend hearing everyone talking about the 10-12 mph winds predicted on race day. The breeze was a factor at some points in the race but it was NOTHING compared to the 30+ mph gusts on Cape Cod! I was experiencing some pain in my hip and it was getting increasingly worse. I always walk through water stops—it may only be 4 or 5 steps but I slow down to a walk. I feel like every time I slowed down at a water stop, my hip was getting worse. So much pain. So much doubt. I hobbled my way past the 30k mat (18.6 miles) and once I crossed it I immediately started walking. I was limping—bad. I started swearing. I walked until the 19-mile marker and tried running again but I only made it about 10 steps. I started crying. I knew this was it. The 3:30 pace group passed me and I cried even more. Side Note: I checked my Run Hou ’16 App when I started walking and saw that Michele and my dad finished together in 2:22:29. It made me so happy to know they ran together the whole way! Entering the park at the 20-mile mark was pretty cool and I wished I was still running. I went through a ton of different scenarios through my head. I knew at this point running was out of the question. Did I want to stop at the next medical tent and ask for a ride to the finish? Not really. I didn’t come all the way to Texas for 19 miles. Should I walk to the finish? 7.2 miles was an awfully long way. How long would that take me? I was probably limping at about a 15-20 min/mile pace. I thought about my clients and gym members that I tell to “never give up” every single day. I couldn’t give up. When I stopped running at the 30k I truly felt like I did give up. Looking at the bigger picture, giving up would have meant giving in to the SAG Wagon. Maybe I couldn’t run but I had to get to that finish line. I wanted that finisher mug! I texted my mom so she wouldn’t worry and soon after I asked if she would start walking backwards on the course to finish the last few miles with me. Without any question or hesitation she started out to find me. Then the 3:40 pace group passed me… and the 3:50 group passed me… More tears. The Michelob Ultra Party Zone was approaching and guess who stopped for a beer?! It tasted pretty darn good. A couple runners asked me how it tasted and that made me laugh. Who am I? I don’t drink beer! And can you believe that Michele turned down a beer on her route? Soon after at 21.7 miles I passed the 35k mat. This was especially tough for me thinking of everyone tracking my run. I felt like so many family members, friends, and clients have been on this journey with me for the past 16 weeks and I didn’t want to let anyone down. By mile 22 I was SO COLD. I stopped at a medical tent and asked for a blanket. Every medical staff member I passed in my last 7.2 miles was great. I was thanking all of them and letting them know that I was walking to the finish. The blanket ended up being more annoying then good but it did block some of the wind and spectators were commenting on my badass silver cape! The spectators, by the way, were also wonderful in these last few miles. So many were cheering for me and encouraging me to keep going. Runners too. I’ve always said the running community is incredible and today my fellow runners did not disappoint. My mom found me at the 38k mark (23.6 miles). I was so happy to see her face. I honestly just wanted company. I was defeated, disappointed, bored, freezing cold and I wanted someone to walk with. She still didn’t really ask me any questions—she was there for me. A little while later my dad appeared! After my mom left to come find me and my dad finished eating his ice cream sandwiches, he decided he wanted to head out and finish with me too. He brought a nice heavy fleece jacket that I wore with my mom’s headband to warm up. The last few miles heading back into downtown Houston were nice with bright, blue skies and a really pretty skyline. I left my mom and dad as we got further into the downtown area and saw Uncle John and Dylan who ran along side me for a couple blocks. John coached me from the sidelines to a little trot—which HURT!—and kept me trotting until I crossed the finish line! I had so many mixed emotions after I crossed the finish line. I was thankful I finished, happy to be done, angry I was hurt, and disappointed I was over an hour past my goal time. Do I celebrate? Do I cry? Should I skip past all the photographers? Do I deserve to call myself a Houston Marathon runner? I didn't stop my watch. I didn’t even look at my time. I didn’t want to know. So what actually happened with my hip? PTs at work are saying bursitis. Maybe I was changing my stride compensating for that aggravating hamstring. Maybe the concrete roads of Houston really were affecting my joints and muscles. 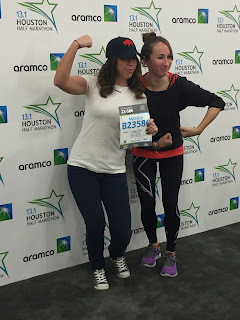 Maybe it was the uneven Houston roads—I felt like unless I was running right in the middle of the road, the roads sloped down causing one hip to be higher than the other. Maybe I didn’t break in my shoes enough. I was so focused on my hamstring that I was kind of ignoring all these other aches and pains that were popping up along the route. Somewhere super early in the race I was feeling a little twinge in my left Achilles. That only lasted a few miles. I want to say my hip started to hurt around mile 7 or 8 but I was thankful my hamstring was holding up so I didn’t think anything of it. 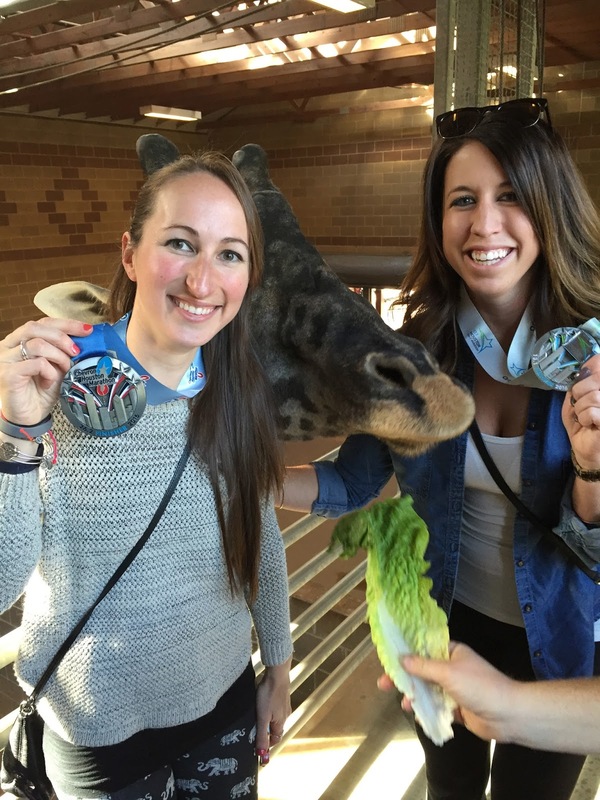 Post-race stop at the Houston Zoo! Use code BRSkiba05 for $5 off registration!